While today’s well-known brands like Portico and Spaces successfully challenged the market leader Bombay Dyeing’s supremacy, some others like Trident are preparing to do so. Players like Swayam, Tangerine, and Maspar and House This! too are successfully carving out their own niche in a market still cluttered by and large with unbranded bed sheets and pillow covers across the country. Despite a healthy growth of 15 to 20% in consumer demand in the rapidly growing Indian market for bed linen, individual players has been facing tough times and challenges for the last one year. The situation is perceived differently by different market players. While everybody agrees that the competition has become more cut throat than ever before, to some extent thanks to the onslaught of online retailers, every player has his own perspective on the current situation and differ on what does the future hold for the industry and for their own brand. At the same time, most of them are positive about the long term prospects of their business and are preparing for next level of marketing in the competitive environment of India’s growing market. 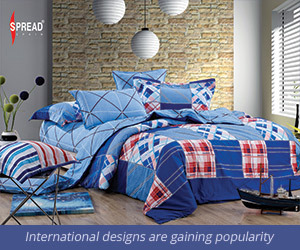 Bed Linen market in India has a fantastic future. At the moment, branded products comprise just about 2% of the market. Since the new age Indian consumers increasingly aspire for high quality and branded products across all categories, bed linen will be no exception. Good brands will become very popular in coming years. 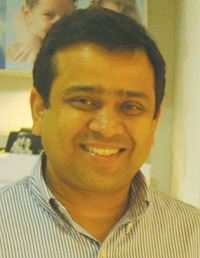 Creative Portico is growing at almost 30-40% every year and the brand is also doing very well. In view of the ever rising e-commerce phenomenon, we feel it is necessary to gain maximum market penetration through that space as quickly as possible. So we are exploring e-commerce option as part of our sales strategy. The market needs more options and we are planning to add more sophisticated, performance-enhancing and value-added items for better health, more comfort and superior lifestyle. Earlier, the reality of Indian market was that it is all about printed bed sheets. Today the consumers seek more variety, more functions, luxurious feel, better health, eco-friendly products and innovative features. Portico New York is offering solutions in all these directions. Over the past couple of years the retail price of bed linen products have gone up a little but there is not much scope for further appreciation in the given market scenario. Market is expected to grow at least 25-30%. Estimated value of Indian home Linen market is Rs.1,400 crorein the organized sector and Rs.12,600 crore in the unorganized. The category has grown at around 8% annually over the past 3 years and growth projections for the next 3 years are also similar. Estimated growth of Spaces was between 24% and 30% over past 3 years and it is projected to be between 30% and 38% for next 3 years. Currently, Spaces is among the top three home brands in India and aspires to be the leader in branded home segment. Apart from Towels, bed sheets, comforters and rugs, we have recently launched Areas Rugs across India and plan to launchBasic Bedding (pillow fillers, mattress protectors) in the coming months. 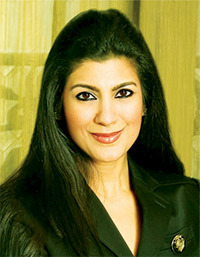 The Indian Home category is dominated by few major players and Spaces is one of them. Innovation, Quality and Product performance are the pillars for us to stand out among competitors. 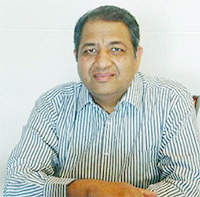 Marketing and branding activities in the proper channels is important for success in Indian domestic market. We are positioning our brand accordingly and have increased the marketing spends significantly. There is a lot of potential in branded segment across channels,namely Sales and Distribution(S&D), Shop-in-Shop, E-commerce, Corporate sales etc. S&D is a major activity for us to tap huge potential for growth and we are taking all the necessary steps to tap emerging Indian market. We also plan to launch Spaces globally through our global e-commerce portal. We already have Welspun E-com operational in UK, US, Germany and Australia. Appointed Parineeti as brand ambassador of Spaces was an important move and we got great leverage from the same last year. We have increased our marketing spends, completed branding activity across India in 200 plus high street furnishing stores and are conducting regional and national events to expand our reach. Indian bed linen market has been growing at the rate of 25 to 30% over the last three years, year on year across all price and quality segments. Swayam has itself has been growing at 30 to 35% per annum. Reason for such high growth is that Indian consumers started spending money on bed linen only 5 years back. Today, bed linen has become a fashionable product. In USA people change bed linen every day whereas average Indians changes it once every week. So having 4 bed sheets in the cupboard is considered sufficient here whereas the requirement would be seven time more in developed countries. Speaking of our own brand Swayam, 3 to 4 years back if the average selling price (ASP) of a product was Rs.800 and segment wise sales break up was 85% printed and 15% solids. Today, the ASP of the same product has reached Rs.1,400 and segment wise sales stand at 80% printed and 20% solids. The shift towards solids is evident. Over the next 3 years we estimate 30-35% growth YOY. As stated, average consumption of bed linen is low in India with an average consumer here spending only 8% on home textiles of what she spends on apparel. This share should go up to 20% to come at par with developed countries. Bed sheets comprise 30% of our imports of home textiles, which is around Rs.5,000 crore and 90% of bedsheet imported is polyester. Today Swayam products are available in 200 stores across India, which should become 400 stores in the next 3 years, giving our brand deeper market penetration. Even today, the branded bed sheet market in India has been growing at 10% per annum while the unbranded continues to grow at a faster rate of about 15%, clearly showing Indian’s preference for cheaper, unbranded products at mass level. Overall consumption of bed linen is increasing by 13% on an average. In India, even today, over 90% of bed linen buying at retail level is done by housewives, which is a very different scenario from a country like USA, where men are almost as important buyers as women. This is an established fact that women tend to be more economical shoppers than men and do not spend simply on a brand unless they find product value too. We have been selling international brands like Esprit Home, Tom Tailor and Pierre Cardin in India for over 15 years. But it is only now that we started seeing the real growth in demand. Our own brand Spread, which again is based on high quality international products which we import, has been our real saviour, where we have not only established ourselves firmly as a brand, but also have been growing consistently for over 10 years. The market is now getting segmented, choice of designs and products are getting linked to segment wise profile of the consumer and hi-end solids are becoming popular in bed linen for the first time in India. 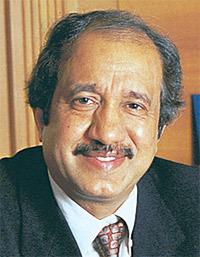 In our experience, it is evident that brands which deliver product value in India, will be the long term winners here. 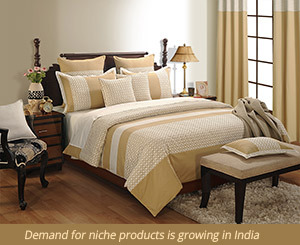 While Indian market for bed linen has been growing by about 15%, growth has been higher in e-commerce. Today e-commerce commands over 10% of total bedlinen sales in India. The Rs.1000+ bedlinens still have only 15-20% of market share in India, 10 years back their share could have been still lower between 3-5 %. Hence, it is a welcome growth. Home textile consumption in India is growing at 15% per annum, but the potential is for 20-25% growth. One of the restricting factors is lack of modern retail infrastructure to support this growth. 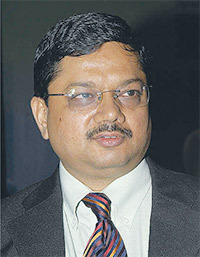 It is likely that we will see higher growth in the Rs.1000 plus price category. On the shop floor, bed linen is always considered a small category. Retailers who focus on it have done very well. Change in attitude of specialty home retailers took place only after LFS launched specialized LFS home stores like Home Centre, Home Stop, Home Town and @home. These formats provided good space to bed linen and customers automatically looked at it seriously.Big Bazaar has contributed immensely in popularizing bed linen. A small but upcoming trend is also visible towards fitted sheets. Demand for comforters and quilts is also growing. Private labels of Large Format Stores are experiencing double digit growth as they offer good prices. E-commerce sector has also pushed this category amongst younger, below 35 years of age consumers. Big outlets like Jagdish Stores, Home Stop and Home Town will survive on the 35 plus age group of customers who have real buying power. Indian manufacturers have upgraded quality and capacities as a result of which, import from China is largely confined to polyester and cheaper cotton items. Tangerine has experienced more than50% growth in its second year of its launch. Tangerine MRPs range between Rs.1500-3000. Tomatillo, the second brand has been introduced at MRP of Rs.1000. India has an unchallenged global leadership in handmade carpets with an impressive 38% share in world exports. Unique designs and skilful hand-knotting, hand tufting and hand weaving leave international consumers simply in an awe. No wonder India has managed to increase its exports for the fifth year in a row, despite sluggish market conditions. 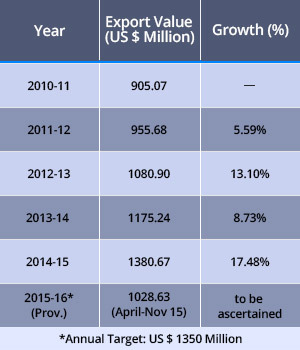 In FY 2014-15 India’s handmade carpet exports went up by a healthy 17% over last year. Carpet Export Promotion Council (CEPC) has played a key role in establishing this lead over the last two decades through consistent efforts towards skill development, market promotions and fulfilling Corporate Social Responsibility. It regularly runs several projects towards education, health, social welfare and social infrastructure in clusters like Bhadohi. CEPC also acts as a catalyst among international buyers, Indian exporters, Government and the carpet weavers. Last year, handmade Carpets earned India foreign exchange worth USD 1.38 billion. Over 2 million rural artisans, including women, are employed by this sector. Despite stiff competition from machine made carpets and other floor coverings like wooden flooring, vinyl, marbles, ceramic tiles and synthetic alternatives, Indian handmade rugs & carpets are preferred by discerning consumers for their cosy, warm feeling, unique textures, colours, designs and materials. Handmade carpets support sustainable, environment-friendly economic movement too. India offers unique carpets and rugs in blends like cotton-jute, jute-wool silk-blends and other combinations with wool and silk. Indian weavers are quick to respond to diverse design & product needs. That is why, despite severe competition, Indian handmade carpets continue to enjoy increasing demand worldwide. 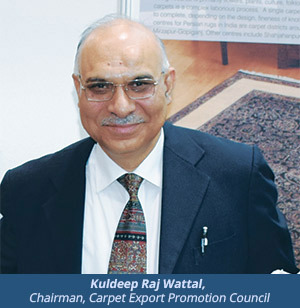 In an exclusive interview with Mr. Kuldeep Raj Wattal, Chairman, Carpet Export Promotion Council reveals the latest international market scenario for Indian handmade carpets to Home Fashion Editor, Arun Roongta. HF: What is the current position of India’s carpet exports? KW: Inspite of many ups and down in international markets, 2015 was a steady year for us. Problems like migrants from Syria etc. have disturbed economic sentiments in Europe. Other regional economic and political problems too have adversely impacted our carpet exports. But demand in USA has picked up, increasing its share in our exports up to 45-46% from 35%. This set off the decline in European share, enabling usto maintain our export growth at 10-12%, which considering the market conditions, must be considered healthy. During FY 2015-16, we shall meet the target of Rs. 10,000 crore, which is much higher than Rs. 8,600 crore in FY 2014-15. Though demand for some of our regular items like shaggy, Indian carpet exports has slackened, we are doing better than our competitors. India has a highly diversified product range priced from USD 10 to USD 1,000 per square meter, which can all market segments- low, middle and high. With such varied price and product options, it is easier to sustain our export growth as some products are always in demand. This year, low-priced(USD 25-40 per square meter) products like hand-tufted carpets have done well. HF: How is Chinese market emerging? KW: Chinese are very fond of hand-knotted or handloom carpets, as they give real handmade feel. Wool and cotton handloom carpets have boosted our exports to China.The Chinese particularly admire Laurie Baft and geometrical designs. But they do not like carpets with backing which give a machine-made look. With more aggressive marketing in China, demand for Indian carpets can grow bigger and faster. Despite big potential, very high import duty of 35% is hampering business in China. Indian Government needs to resolve this with its Chinese counterpart. HF:And what about Middle-East Asia? KW: Middle-Eastas a market has been stable. Demand is primarily for classic oriental and silk carpets. With Iran’s production going down, India is becoming more popular here. It has both quantity and price advantage over Iran, leading to increased demand for fine Indian silk rugs. In value terms, this market has been stable, which under current conditions is a good achievement. HF: In 2015, which countries contributed to export growth? KW: Germany and USA continue to be the biggest markets for India. UK is important, but holds only 10th or 11th position. I think China will acquire second or third position soon from its current 10th or 12th position. We have just started promoting Indian carpets in China. Chinese people really like them. From just one trade fair participation, we are increasing to 6 or 7 trade shows in China. Response from the trade and consumers is tremendous, which is the first requirement to succeed in a large market like China. We need to create more awareness for which Government of India support is also required. HF: What kind of support? KW: Primarily in product promotion. For example, in organising exclusive Indian carpet shows in China, putting up promotional road shows to explain unique features of Indian carpets. These can be part of larger Indian cultural and country promotion activities in China. We need to showcase that Indian carpets are world-class products, with excellent price and value for money. HF: Where does India’s share stand in world market? KW: It remains at 37-38%. We are optimistic to increase it further. HF: Do you see a major impact of the Middle-East crisis like Syria on India’s carpet exports? KW: Crisis like wars and instability always cause a concern in any market and their impact definitely percolates down on the people. They start worrying about the basics and lose focus on luxury items like carpets. So, some impact would be there. HF: Are Far-Eastern countries like Korea, Taiwan, Thailand, Indonesia and Australia emerging as markets? KW: We have preferential trade agreements with most of them. For example we have CEPA with Korea and Japan. We are even allowed duty free export in some countries, yet their imports are not going up. HF: What about African and Latin American countries? KW: Latin America can be a big consumer of Indian carpets, but at 35-38%, import duties are very high, increasing the landed cost for buyers. If import duties become realistic, potential for export in these countries is good. HF: How much is the import duty in other countries? KW: It is much lower. 8% in Europe. About 6% to 8% in USA. HF: What about Turkey? It was emerging as a big market for the last few years? Domotex in Hanover is the most important annual global trade show for rugs, carpets and floor covering industry, where designers, manufactures, importers, wholesalers and retailers from all over the world converge for their annual meeting and business discussions. 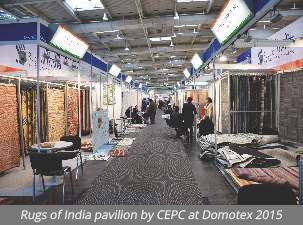 From India’s perspective, it is the largest exhibiting country at Domotex, which is well justified as it offers one of the most diverse range of handmade carpets in the world and commands the highest 38% share of the world market. Domotex allows Indian carpet & floor covering manufacturers and exporters to not only interact and transact business with the buyers from all over the world, but also understand the latest market and product trends, upcoming fashion, design and colour trends, new techniques, materials and technologies with current international perspective. In a way Domotex unfolds the next buying season for Indian exporters, while allowing our manufacturers to unveil their latest creations to the world simultaneously. KW: Though Turkey was a big importer, its buying reduced suddenly as import duty on hand-knotted carpets was increased form 8% to an obnoxious 50%! HF: Does India import carpets too? KW: Only machine made carpets. But there is no competition between hand-made and machine made carpets as buyers are different for both. HF: What is the share of handmade carpets in overall global carpet consumption? HF: Why such a low share? KW: Because in the contract and projects markets mostly machine made carpets are popular. These segments are the major carpet buyers in the world. Handmade carpets are more the pieces of art and craft, which are asked by the discerning buyers. They are log lasting too! HF: Are Indian manufacturers switching over to machine-made carpets as well? KW: Some of them are. But only to cater to the domestic demand. But for exports, there is no production of machine made carpets. As India doesn’t have much production of machine made carpets, lot of cheap machine-made carpets are also being imported. But in the international market, India is clearly known for handmade carpets only. Those who desire hand-made ones, prefer to depend on Indian manufacturers, as Indian is amongst the best and cheapest in the world in this category. That is why we have such a large (38%) share of global handmade carpet market! HF: But why can’t we export machine made carpets too, in addition to the handmade ones, if the market for machine made ones is so large? KW: At least for now it looks difficult for India for several reasons. First of all we have no cost or any other strategic advantage in this segment. For example, Turkey is one of the biggest exporter of machine-made carpets to Europe. It has duty free access in that market. Others’ products will attract 8% import duty. Even countries like Iran buy big quantity from Turkey. There again they enjoy favourable trade terms. We do not have raw material for machine made carpets, which we have to import from counties like Turkey. So on one hand we have to import raw material and on other hand face import duty on finished goods. Besides, distances to the markets are longer. How can we stand such a competitive scenario? KW: Belgium is today more or a producer for carpet making machinery rather than being a producer for machine-made carpets. HF: Where do you see the demand trend going for handmade carpets in the next one year, especially in terms of products and designs? KW: Abstract designs are a major trend. People have been buying oriental designs for quite some time and certainly seek a change now. In terms of materials wool and viscose blends and pure viscose will be preferred over pure wool. This is because the younger generation prefers the fashion elements like shine, resilience and strength of viscose. They do not want very long lasting, but bright, trendy and cheaper floor coverings, which they can change frequently. Popularity of polyester based, hand tufted shaggy carpets is being replaced in the last 2-3 years by wool-viscose items, which are popular in both hand-made and handloom categories. In terms of pile and thickness, trend remain the same as before, but colours, designs and materials are in for a change. HF: What is the current situation with Kashmir, especially with its silk carpets? KW: Silk carpet production is quite stable. With neither a surplus nor a scarcity of goods, the demand and supply situation for silk carpets in Kashmir is quite balanced. There is no disruption in regular production and hence the situation is healthy. HF: What is the status of the Training Programme for carpet weavers started by the Council recently? KW: CEPC took a very big initiative last year, beginning with Jayapura, which is from Prime Minister Narendra Modi’s constituency. We started training local women of that village in carpet weaving in their own places. In due course, the training programme was further expanded to Bhadohi, Mirzapur and other areas under the Cluster Development Scheme of Ministry of Textiles, Government of India. By now we have successfully opened 144 Training Centres. Each centre trains 24 persons, 12 on hand knotted and 12 on hand tufted carpets. 70% of the trainees are women. We are very happy that these trained workers are getting linked to the industry through CEPC immediately on completion of their training. The results so far are very encouraging. We have been able to create additional job opportunities for rural women on one hand and fill the gap of worker shortage for the industry to some extent. Handmade carpets primarily work on either Oriental designs or abstract designs. Geometric designs are not so popular in handmade carpets. India has several large carpet weaving clusters with specialities of their own. This makes the country an excellent source for a diversified range of carpets. Bhadohi-Mirzapur belt is the most important cluster, where the entire economy revolves around carpet weaving. Looking at the size and importance of carpet weaving in these centres, they have been given special status under Government of India’s Cluster Development Scheme. Panipat is another major producer of floor coverings today. It has grown from Rs. 300 crore to Rs. 3,000 crore, which is a significant jump in a few years. Panipat makes all kinds of carpets and floor coverings, but is especially very good with hand tufted carpets and bath mats. I would rank it as second most important carpet centre in India after Bhadohi-Mirzapur belt near Varanasi. Jaipur is the third important production centre, followed by Kashmir and Agra.